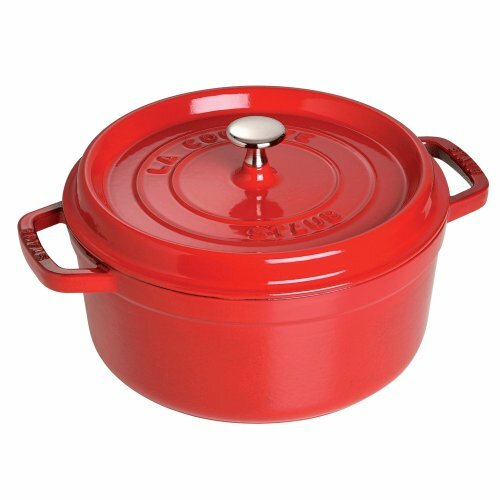 The Staub cocotte is unsurpassed for slow-cooking meats and vegetables to tender perfection, and for simmering hearty stews and soups. Cast iron possesses exceptional heat-retaining qualities, so the pot heats evenly throughout. The innovative lid features tiny spikes on the interior that continually release condensed liquid back onto the food, yielding moist, flavorful results. Staub's special matte black enamel interior and self-basting spiked lid guarantee perfect browning and braising for flavor-enhanced food. With their exquisite enamel finish, each piece transitions beautifully from the kitchen to the table. From comfort food to sumptuous suppers, every dish is special when served in Staub. Staub enameled cast iron cookware is the choice of the world's best chefs. With exceptional durability, it is perfect for day-to-day use in both gourmet home kitchens and prestigious restaurants around the world. Built to last a lifetime, these heirloom pieces can be passed from generation to generation.